The elbow is composed of three bones: the humerus (the bone in the upper arm) and the radius and the ulna in the forearm. 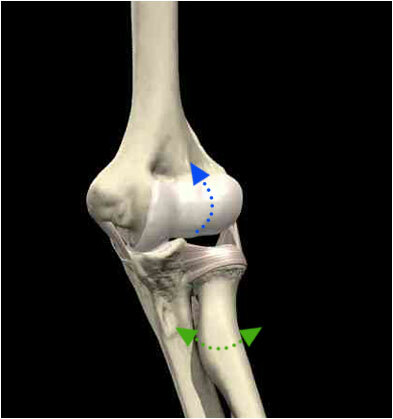 A fancy hinge joint that can not only swing back and forth (flex and extend—blue arrow), but also swivel, the elbow allows the forearm and hand to rotate into the palm-down position (pronation) and the palm-up position (supination) (green arrow). All these motions come into play during the golf swing.